If your facility is experiencing challenges associated with the presence of hydrogen sulfide gas (H2S) or any other malodorous condition, then the specialist consultancy team at No Fault Services can assist with both remediation and prevention. We are the trusted H2S consultants of choice by many of the country's biggest facilities, helping clients not only avoid the serious risks to occupational health safety, but also with preventing non-compliance exposure, reducing legal exposure, as well as avoiding extensive damage to their property and infrastructure. The prevention of hydrogen sulfide gas is an issue of critical importance to facilities directors. - H2S is a deadly gas that in high enough concentrations can even kill in a single breath. Even at lower concentrations it can kill in minutes. (It is as deadly as cyanide). It commonly exists in a dissolved state in water. - It exists at facilities across the US, caused by the decay of organic matter in the waste water system. Certain types of facilities offering food service can be particularly susceptible, but any facility can experience issues as it may be further down the wastewater system from other more susceptible facilities. (Additional H2S challenges also exist for the oil and gas industry and the paper-making industry). - It is a huge potential occupational health and safety issue. Avoidable H2S-related deaths in the workplace are reported every year. Non-compliance with OSHA rules on H2S can lead to death and considerable legal liability. If you have manhole covers on your site and ever open them, you need to be fully aware of all of the hydrogen sulfide risks and be compliant with all OSHA safety standards (including H2S detection equipment, ventilation, and if necessary respirators). 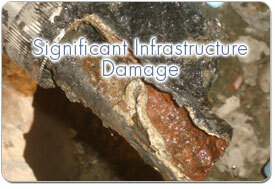 - It can cause extensive physical damage to a drain and wastewater lines, interceptors, and lift stations. In a dissolved state it can not only be acidic, but in low levels of oxygen it can react to form corrosive sulfuric acid which can destroy your lines and interceptors from the inside. At larger facilities the damage can run into the millions of dollars. This damage is avoidable with H2S remediation. - It can be bad for business too. At low concentrations the presence of H2S gas creates a rotten egg (also known as sewer gas) smell which can be very unappealing for customers and employees, while the public relations fallout from incidents can be serious. - Environmental non-compliance is a further issue. In addition to OSHA standards, high levels of H2S can breach environmental standards as well, and leaks from damaged lines and interceptors can create further environmental hazards. Read more about the HEALTH AND SAFETY DANGERS, DAMAGE TO PROPERTY and ENVIRONMENTAL RISKS posed by H2S. There are common symptoms that can suggest an H2S issue. Of course, preventative action is very vital to avoid issues arising in the first place - even when you don't have these symptoms, you want to avoid getting them. - The most serious symptoms are health-related incidents, including injury to employees as a result of H2S. - The rotten egg smell (or sewer gas smell) can be prevalent at very low levels. This is the best known symptom of H2S, however it is critical to know that it can only be detected at low levels. At higher levels H2S stops your sense of smell (olfactory receptors) from functioning - and thus it can't be sensed at all. - H2S detectors - facilities in compliance with OSHA standards may detect a build-up of hydrogen sulfide gas with H2S detectors. 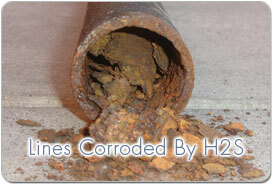 - Corrosion to lines and interceptors, including corrosion to both metal and concrete. - EXPERT CONSULTANCY: We can diagnose and solve your issues. 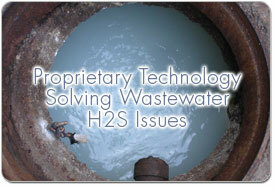 - A COMPLETE SOLUTION: We have proprietary patented technology and techniques to solve your H2S issues, and reduce the production of gas from the breakdown of waste material. This technology is unique, and only available to our clients. - TRUSTED ACROSS THE US: We are the trusted choice of leading facilities across the US for this sensitive issue. Read more here. - PREVENTION AND COMPLIANCE: We have a range of preventative programs that can help you avoid H2S issues, including Best Management Practices and our Source Control Program. - MAINTENANCE SOLUTIONS: We have experienced maintenance teams in place to implement, repair and replace infrastructure that has been damaged by the presence of H2S. - SPECIALISTS: No other consultants have the combination of expertise, specialization, experience and technology to deal with hydrogen sulfide at facilities. 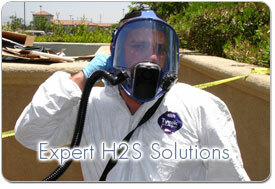 You can read more about our H2S solutions on this page: Hydrogen Sulfide Solutions. To find out more about how we can help with your H2S questions or issues simply call us at 1-800-313-5234, or click to register here for access to further online information on our H2S consultancy and solutions, and how we can help your facility. 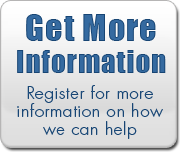 Register for videos, testimonials and more information on how we can help with your H2S issues.